Hot Tub. River View. Pet Friendly. WiFi. Gorgeous! 20% OFF with 1 Week Stay! Escape from the city to River Song located inside the Coosawattee River Resort which offer’s amenities such as a community pool, playgrounds, river access, golf and hiking. Nearby national forest and wilderness areas provide year round outdoor recreation which include, white water rafting/kayaking/tubing, hiking, biking and fishing. Visit beautiful Amicalola Falls State Park and be amazed by the beauty of the water fall or hike on the Appalachian Trail. After a day of playing, relax in your own private hot tub while listening to the river rush by. 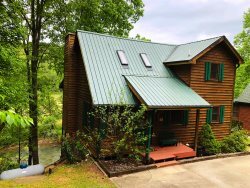 The cabin is nicely furnished with authentic cabin décor a gorgeous rock wood burning fireplace, large outdoor decks and a modern kitchen with stainless appliances. You will also find comfortable beds to sleep up to 10 guests a gas grill, ping pong table, card table, corn hole and a karaoke system for your enjoyment. Most everything you need is provided, kitchen utensils, pots and pans, bowels, dinnerware, toilet tissue, paper towels, bath and kitchen towels just bring food, and personal items and enjoy. River Song is dog friendly so bring your fur babies and come on up. The Coosawattee River Resort has something for everyone. From fishing and hiking to swimming and playing in (and on) the river, this resort was made for creating memorable moments. As a guest staying at River Song, you will receive a Guest Pass for all the members of your party and these will get you into all of the amenities, so don’t wait another minute. With so many things to do in the resort, you might now find time to do anything else! Roads leading to cabin are good. There is parking at the top of the driveway. Kelli was a great host, her communication was extraordinary and so was the cabin. The cabin was clean and beautiful. There were so many amenities that made the trip amazing. Tip for future guest : DONT PANIC the hot tub works either ask Kelli or google how to take it out of economy mode. The master bathroom has a beautiful tub with jets great for relaxing. I loved every moment of our trip and will definitely come back again. I want to say thank you to Chris, Marshall & especially Kelli. Kelli had made my stay phenomenal and i was blessed to have a host as great as Kelli. Whenever i had a question she was very responsive and didnt hesitate to help me. She was helpful even when she wasnt on duty and if thats not premier customer service then i dont know what is. Kelli made me feel special and i would definitely be doing Airbnb with CabiNation as long as people like Kelli are working there! Cabin was a wonderful place with amazing views, phenomenal workers that are always there to help you with whatever you need and theyre so thoughtful! We had a great stay in this beautiful mountain home. The house was very well appointed and we appreciated the special touches like the box filled with bath necessities for things we forgot to bring. The convenience to Elljay and great fishing places were nice. The drive through the resort and the driveway was a little hard to get used to.. but, we did fine with it. Thank you for allowing our family to enjoy some quality time together in your mountain home. Cabin had plenty of space and had a great game room for family time. Thank you! This house was amazing and the views are gorgeous! We especially loved deer-watching as there are TONS of them roaming the resort. If its raining when you stay, you may need four-wheel drive to get up the driveway to leave. The place was great in a nice area. Lots of fun things and games inside the cabin. Be a bit cautious about the kitchen as it is not the best stocked, and can be a bit difficult to cook for a big group. Beautiful, roomy, comfortable cabin. Beautiful scenery of Coosawattee River and amazing scenery of deer. We had a wonderful time. Cabin was clean and CabiNation was quick to get back with us on questions. Definitely recommend a stay at this cozy cabin if your looking for a place to go! This house was amazing! It has everything you would need. We would love to rent it again! Erica A.